Mike Salinas (Top Fuel), Bo Butner (Pro Stock) and Hector Arana Jr. (Pro Stock Motorcycle) are also provisional qualifying leaders in their respective categories at the fourth of 24 events on the 2019 NHRA Mello Yello Drag Racing Series schedule. 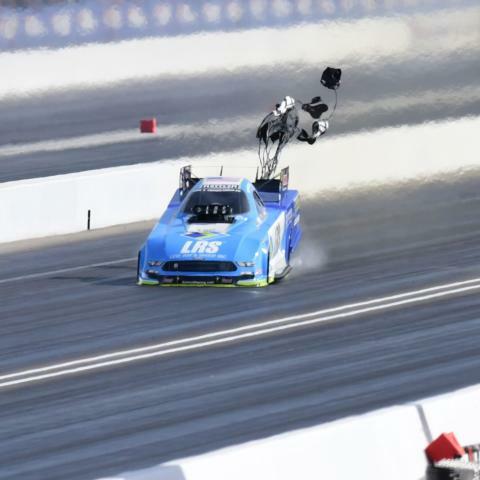 Wilkerson powered his Levri, Ray & Shoup Ford Shelby Mustang to a 3.895-second pass at 323.50 mph to land at the top of the Funny Car class after the second qualifying session. Wilkerson is looking for his first No. 1 qualifier position since 2017. He competed in the final round in Gainesville two weeks ago and is in search of his second career victory in Las Vegas. "We do spend a lot of time looking at our parts," said Wilkerson, who won in Las Vegas in April 2008. “I think that makes our car as good as it is, everywhere we take it. It's easy to be good at sea-level, but when you can go from Gainesville to here, that’s proof that my guys do a good job making all my parts close to the same and I can turn a knob and put a head gasket on it and it actually acts the same. Ron Capps is currently in second, and reigning World Champion J.R. Todd is third. Salinas sits atop the Top Fuel division with his run of 3.705 at 328.46. He drove his Scrappers Racing dragster to the provisional No. 1 spot during Friday’s second qualifying session. Salinas is in search of second career No. 1 qualifier and his first career NHRA event title. In Pro Stock, Butner ran a 6.648 at 206.67 in his Jim Butner's Auto Chevy Camaro during the second session to take the top spot. Butner was the event winner in Pomona and Gainesville and has been to five final rounds at The Strip at LVMS. Arana Jr. raced to the No. 1 position on the Lucas Oil EBR Pro Stock Motorcycle with a run of 6.884 at 195.17 during his second qualifying pass. He is in search of his first No. 1 qualifier position of the 2019 season. He owns two No. 1 qualifier positions from The Strip at Las Vegas Motor Speedway. Mike Salinas, 3.705 seconds, 328.46 mph; 2. Steve Torrence, 3.721, 326.95; 3. Brittany Force, 3.733, 322.88; 4. Leah Pritchett, 3.743, 328.06; 5. Clay Millican, 3.750, 325.06; 6. Billy Torrence, 3.769, 324.75; 7. Doug Kalitta, 3.771, 323.74; 8. Terry McMillen, 3.785, 321.27; 9. Scott Palmer, 3.807, 312.57; 10. Antron Brown, 3.813, 323.66; 11. 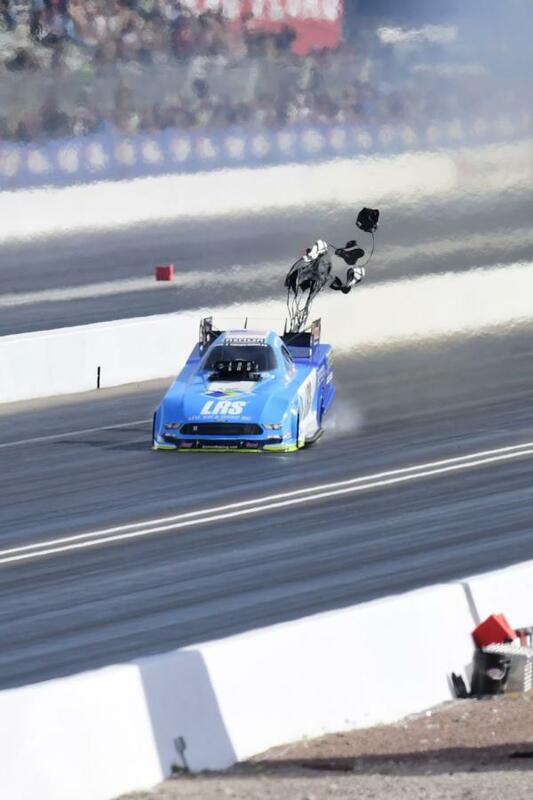 Austin Prock, 3.840, 316.97; 12. Cameron Ferre, 4.099, 265.27; 13. Richie Crampton, 4.675, 166.39. Tim Wilkerson, Ford Mustang, 3.895, 323.50; 2. Ron Capps, Dodge Charger, 3.897, 325.92; 3. J.R. Todd, Toyota Camry, 3.919, 323.04; 4. Matt Hagan, Charger, 3.924, 327.03; 5. Bob Tasca III, Mustang, 3.928, 318.77; 6. Shawn Langdon, Camry, 3.931, 324.67; 7. John Force, Chevy Camaro, 3.946, 320.74; 8. Cruz Pedregon, Charger, 3.950, 322.11; 9. Jack Beckman, Charger, 3.956, 321.27; 10. Robert Hight, Camaro, 3.962, 323.97; 11. Tommy Johnson Jr., Charger, 3.968, 316.15; 12. Jim Campbell, Charger, 4.044, 313.00; 13. Phil Burkart, Charger, 4.084, 298.40; 14. Terry Haddock, Mustang, 4.264, 287.84; 15. Gary Densham, Mustang, 4.382, 300.66; 16. Jeff Diehl, Camry, 4.382, 228.85. Not Qualified: 17. Jonnie Lindberg, 4.872, 163.33. Bo Butner, Chevy Camaro, 6.648, 206.67; 2. Jeg Coughlin, Camaro, 6.665, 206.48; 3. Rodger Brogdon, Camaro, 6.665, 206.39; 4. Alex Laughlin, Camaro, 6.670, 206.29; 5. Matt Hartford, Camaro, 6.675, 206.51; 6. Erica Enders, Camaro, 6.676, 206.54; 7. Deric Kramer, Camaro, 6.677, 206.10; 8. Jason Line, Camaro, 6.681, 205.94; 9. Fernando Cuadra, Camaro, 6.683, 205.22; 10. Greg Anderson, Camaro, 6.688, 205.63; 11. Steve Graham, Camaro, 6.714, 206.29; 12. Shane Tucker, Camaro, 6.732, 203.80; 13. Joey Grose, Camaro, 6.751, 204.63; 14. Alan Prusiensky, Dodge Dart, 6.828, 201.94; 15. Chris McGaha, Camaro, 11.025, 81.61; 16. Jeff Isbell, Ford Mustang, 15.220, 54.48. Hector Arana Jr., EBR, 6.884, 195.17; 2. Matt Smith, EBR, 6.911, 196.50; 3. Eddie Krawiec, Harley-Davidson, 6.919, 195.05; 4. Andrew Hines, Harley-Davidson, 6.947, 194.16; 5. Karen Stoffer, Suzuki, 6.949, 193.49; 6. Ryan Oehler, Buell, 6.980, 193.65; 7. Steve Johnson, Suzuki, 6.983, 192.25; 8. Angie Smith, EBR, 6.991, 195.42; 9. Jim Underdahl, Suzuki, 6.997, 190.43; 10. Jerry Savoie, Suzuki, 7.017, 189.36; 11. Angelle Sampey, Harley-Davidson, 7.043, 192.00; 12. Freddie Camarena, Suzuki, 7.046, 192.25; 13. Scotty Pollacheck, EBR, 7.053, 190.51; 14. Joey Gladstone, EBR, 7.063, 189.79; 15. Cory Reed, EBR, 7.083, 190.54; 16. Jianna Salinas, Suzuki, 7.097, 187.60. Not Qualified: 17. Katie Sullivan, 7.156, 188.81; 18. Hector Arana, 7.439, 146.21; 19. Kelly Clontz, 16.925, 38.60.